When I had bought pork tenderloin a couple of weeks I froze one of the tenderloins, as I usually do, so we can make one for another meal on another night. I decided to use it the other night after I had seen this recipe from Williams-Sonoma, but I wanted to make a little change to it. The original recipe is a glazed pork tenderloin with pear and thyme, but since I am the only one who really likes to eat pears in out house (the other two just kind of tolerate them when I cook with them), I decided to change it up just slightly by using some apple instead. Apples go so well with pork anyone that it just seemed like an easy and smooth transition for this recipe. This one is very simple with just a few ingredients and can be done in about 30 minutes total, making it even better. Season the pork tenderloin well with salt and the freshly ground black pepper to taste. In a ovenproof saute pan or cast iron pan set over medium-high heat, warm the olive oil until it is shimmering. Sear the pork tenderloin, turning it occasionally, until it is well browned, about 6 to 8 minutes total. Transfer the pork tenderloin to a plate. Add the red onion and the pears to the pan and saute them for 1 minute. Return the pork to the pan and drizzle it with the honey and balsamic vinegar. Scatter the thyme leaves in the pan. Transfer the pork to the oven and roast it until the juices run clear when the pork is pierced with a knife, about 15 to 20 minutes. Transfer the pork to a cutting board, cover it loosely with aluminum foil and allow it to rest for 5 minutes. Cut the pork into slices about 1/2 an inch thick. Divide the pork, pears and onion wedges among the individual plates, drizzle with the glaze from the pan and serve immediately. 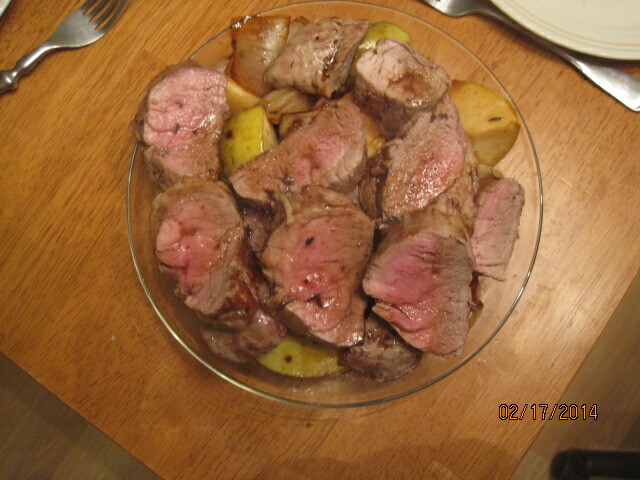 As I noted early, I substituted 2 golden delicious apples that were cored for the pears and cut the apples into wedges and cooked the pork with them. While I think the dish would be great with pears, I think it turned out just fine with the apples instead. The mix of the honey and the balsamic vinegar made a great glaze for the pork and for the apples and the flavor was fantastic. The best part – it was done in 30 minutes and all I needed to do was add a couple of side dishes and we were good to go. Easy to make and a fast clean up. That’s all I have for today. Check back tomorrow when I will go over one of the side dishes I made that was fantastic – a peas and carrots risotto. It’s a good one so you will want to check for that one. Until then, enjoy the rest of your day and enjoy your meal!